Material:Plastic Size:as picture show Color:Transparent Weight:110g Occasion:Party,Wedding & Engagement Package include: (Balloon not include) one sets:1 x base and 7 x balloon sticks and cup Please note this package is from China,so usually you need wait 20 - 30 days . If your order amount more than 10 USD,get free faster shipping .^_^ If you want to wholesale,please feel free contact us .\(^o^)/ If you don't like our products ,please feel free contact us . ⊙﹏⊙ No matter what problems or needs you have,please feel free contact us. The LED stand has two setting mode where you can set the light. One you can set which will remain still white light. 2nd mode will illuminate with multi colors light. For My Wife. But a Wife is Always There. 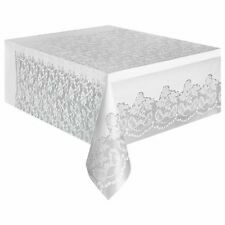 White Lace Table cover / Table cloth NEW. Box clever and get great service and great deals from CRH Inspirations. This item is a great buy and perfect for big parties or a personal gift. Great idea for that special Anniversary Married in 1969. (printed colour always differs to your screen). Printed a4 on Premium Textured Matte Card to give an aged effect. 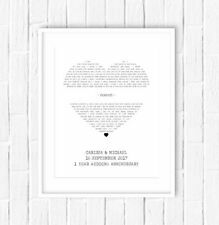 Personalised 1st Wedding Anniversary paper print gift. Great idea for that special Anniversary Married in 1989. (printed colour always differs to your screen). Printed a4 on Premium Textured Matte Card to give an aged effect. Personalised First wedding anniversary print! 1st Paper anniversary print! Makes a perfect wedding anniversary gift! We can even include the number of years married i.e. "Happy 1 year anniversary" or "Congratulations on 40 years married" or "Ruby wedding" etc at no extra cost! Personalized Best Friends Forever set of 3 broken heart Key ring. Key ring attached ready to gift made from high quality 4 mm clear cast acrylic. Double check and reread text to avoid typos. Makes a perfect wedding or anniversary gift! 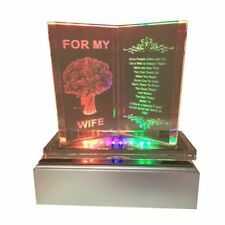 If this gift is for an anniversary we can even include the number of years married i.e. "Congratulations on 40 years married" or "Ruby wedding" etc at no extra cost! Crystal (15th) China (20th) Silver (25th) Pearl (30th) Coral (35th) Ruby (40th). Date of the marriage. An ideal gift for a Special Wedding Anniversary. At no extra cost to you. Or for any Wedding Anniversary in between. For all the tears of laughter you have shared. Love Hearts. To remind you how much you are loved. A FABULOUS ANNIVERSARY GIFT YOU WILL BE PROUD TO GIVE. Love Heart Confetti. To shower you both with love. 10cm wooden heart painted white & decorated with ivory flowers and an organza bow. Celebrate a special couples Ruby Anniversary with a personalised wine label to toast 40 years of marriage. This personalised wine label gift is perfect for this special occasion! 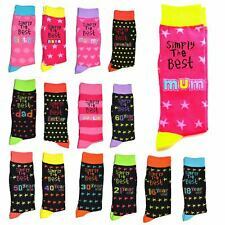 Perfect unique personalised gift idea. Lovely small gift, as well as looking after your keys, this keyring can also hang on bags or in the car. Double sided keyring. 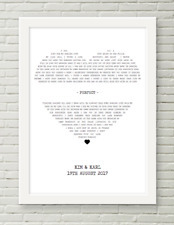 Lovely personalised Print for a 1st wedding anniversary gift in any fonts or colours! The print will be A4 in size. 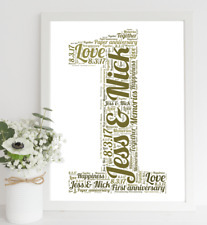 Perfect unique personalised gift idea. Dark Contrasting Engraving On Both Sides For Free! 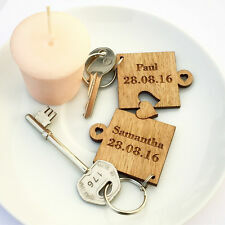 ·Beautiful, laser-cut & engraved female or male shape keyrings. eg: Peak wedding Season, Christmas etc. 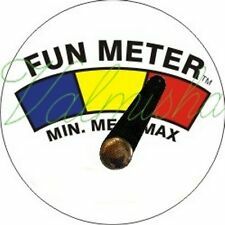 ·Suitable for: weddings, valentines, anniversary's, etc. ·This is the perfect gift to share with the one you love. Personalized Heart Puzzle,Best Friends,Jigsaw Key ring. • Double check and reread text to avoid typos. • Key ring attached, ready to gift. MOON LUNAR REAL ESTATE CERTIFICATE PRINTED ON 100%ACID FREE 180gsm A4 LASER PHOTO PAPER THESE GREAT UNIQUE, UNUSUAL CERTIFICATES MAKE GREAT FUN GIFTS & NOW YOU CAN SAY I LOVE YOU TO THE MOON & BACK! Also available for any anniversary. Perfectly Beautiful Gift. Make It Personal. Size 120mm x 130 mm with 30mm spike. Beautiful handmade wooden plaque. Personalised wedding anniversary gift. eg 1st, Luke & Erin. All prints are printed on high quality A4 220gsm paper. This is a genuine sixpence coin that has been ultrasonically. China (20th) Silver (25th) Pearl (30th) Coral (35th) Ruby (40th). Date of the marriage. An ideal gift for a Special Wedding Anniversary. Or for any Wedding Anniversary in between. At no extra cost to you. Personalised Print. Date of the marriage. Ideal for any anniversary. for more great personal gift ideas and background designs. The information is set on a lovely quality cream card background. Personalised Print. Paper (1st), Tin (10th), Crystal (15th), China (20th), Silver (25th), Pearl (30th), Coral (35th), Ruby (40th). Date of the marriage. An ideal gift for a Special Wedding Anniversary. Personalised wedding anniversary gift cream heart 10cm x 10cm. decorated for 40th wedding anniversary with small red heart and red organza bow. Personalised Mummy & Daddy Gift Jigsaw Keyrings. and Free Gift Bag. Perfectly Beautiful and Thoughtful Gift. Made from high quality 3mm clear acrylic. Make It Personal. and as a pair fit together perfectly.